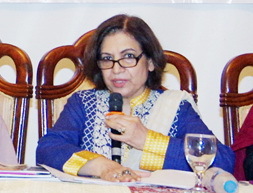 Lahore: Provincial Ombudswoman Mrs. Farkhanda Waseem Afzal has said that it is binding upon all government and semi-government departments to ensure implementation of Harassment Act so that protection could be provided to the women at workplace. She expressed these views while addressing a seminar. Farkhanda Waseem Afzal said that most of women cannot do job due to non-availability of best working atmosphere and they are harassed. She said that the Act 2010 was enacted for resolving all problems of women and Provincial Ombudswoman office was established in 2013 for implementation on this law. She said that the confidence of women has restored and they send their complaints to Provincial Ombudswoman and justice is provided to them as per law. She said that there should be a committee comprising two men and a woman in every department so that the women could first register their complaints with it. Explaining Act 2010, Farkhanda Waseem Afzal said that this law provides protection to working women and it is applicable to all government, semi-government and private registered institutions in the province. She said that Ombudswoman institution is playing an active role for resolving all complaints of women. She said that punishments of various nature are awarded on proving crime and implemented immediately. She told that more than 48 complaints have been decided so far and appeal against the decision of Ombudswoman can only be submitted to the Governor.